Petri Gassendi Disquisitio metaphysica seu dubitationes et instantiae adversus Renati Cartessi metaphysicam & responsa. Quarto *4, **4, A-Z4, Aa-Rr4 First Edition. Bound in original full sheep skin with gilt spine and label.This is a nice clean copy. In 1641 the theologian and mathematician Marin Mersenne invited Gassendi and several other eminent thinkers to contribute comments on the manuscript of René Descartes’s Meditations (1641); Gassendi’s comments, in which he argued that Descartes had failed to establish the reality and certainty of innate ideas, were published in the second edition of the Meditations (1642) as the fifth set of objections and replies. 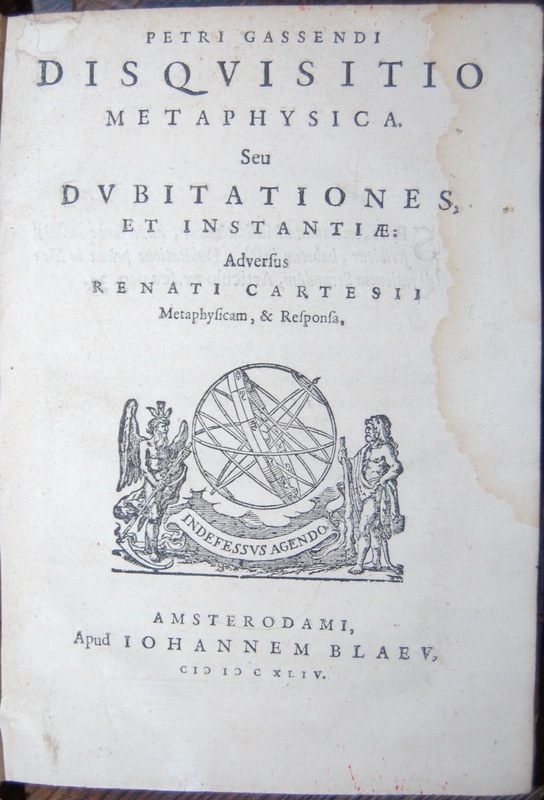 Gassendi enlarged upon these criticisms in his Disquisitio metaphysica, seu duitationes et instantiae adversus Renati Cartesii metaphysicam et responsa (1644; “Metaphysical Disquisition; or, Doubts and Instances Against the Metaphysics of René Descartes and Responses”). Gassendi believed that there was no conflict between his mechanistic atomism and the doctrines of Roman Catholicism; indeed, he took pains to emphasize their compatibility. Although his works were originally published in latin , a French abridgement of them appeared in the second half of the century, as did English translations of various excerpts. His ideas were taught in Jesuit schools in France, in English universities, and even in newly founded schools in North America. Gassendi and Descartes both believed that all natural phenomena could be explained in terms of matter and motion alone. They disagreed about the details of their mechanical accounts of the world, in particular about their theories of matter and their approaches to scientific method.